Porks. The ones you love. Presenting a double bill featuring 'Babe' and 'Bubba' - the caucasian and black pig mascots of LMB, respectively. A result of diversity initiatives within LMB, these pigs point their snouts at different target groups - the pink one snorts at the typical indigent WASP net user, while the black one is aimed at third-worlders who fondly remember the disgusting animals that roamed the garbage dumps of their homelands. The animated Flash even has a black fly buzzing around the noses of these creatures. For that alone, I give these two ads extra points for creativity. Pictured above, a dog that either ate a really long weiner or a weiner-dog that must win first place at the Westminster Dog Show each time. In its animated form, the dog's glittering eyes pulsate, mesmerizing you into doing silly things, like acting like you're taking a shower, or actually clicking on the ad. In this static screen capture however, we see the dog's soul in its true nature - the soul-less black eyes beckoning a netizen into the dark, gaping void of mortgage-refinancing. Let's start with an innocuous one... the diamond that sometimes appears when you sign-off from Yahoo. What does a huge, red diamond have to do with mortgages and bills? 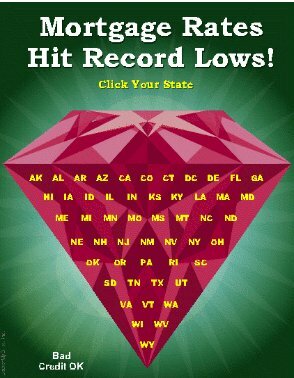 If you had bad credit, would you be desperate enough to click on a diamond? Also note: The states are arranged in simple alphabetical order, showing no creativity or spontaneity in the ad's creation. LowerMyBills (henceforth abbreviated LMB) probably used a bored teenager who had a Macromedia license to crank this one out.